The world is dotted (literally) with numerous amazing and highly developed places where there is no end at all to great possibilities even while the life is so beautiful. Canada, the UK, the US, Germany, France, Hong Kong, Singapore, Australia…the list is long and very impressive. While all these and several other places draw a sea of migrants, it is Australia that perhaps captivates the visitors and the would-be migrants the most. It is a fact that people from different age groups look at immigration to this hotspot with different aspects and high hopes. Students may be attracted to the nation’s world-class universities where in quality education is offered, whereas the overseas immigration motivated wealthy people may think of making rewarding and profit-making investments in the highly developed economy that offers excellent investment options to those with deep pockets. Some people may wish to live there in after retirement, and some simply want to migrate to it because of their exclusive skill that bags them a nomination from an Australian employer. Reasons may be many, but the pathway is common. The applicant who dreams to settle in the nation needs to know about the Australia immigration PR. The Australia Immigration PR holders enjoy enormous benefits and with the PR Card the gateways for seizing the citizenship of the country opens up for them. This visa is especially formulated for the trained manpower which has managed to grab a nomination from an Australian state or territory. This visa subclass is essentially for all those aspirants who have sponsorship from an eligible Australian relative. The visa allows living and working for a period of 4 years in the specific regional area even as it is legally valid for a period of 4 years. This visa category puts forward a golden opportunity for the aspirants to submit an application for a Skilled Regional Subclass 887 Visa after completing a period of 2 years of living in the Kangaroo Land (for those not tuned in Australia is also known as the Kangaroo Land). This includes 12 months of working in the country as well. Under this specific overhead, the eligibility for the Australia immigration PR must be supported with a state or territory nomination or sponsorship from an entitled relative. To take this route for immigration, the candidate needs to submit an Expression of Interest (EoI) through the SkillSelect. An applicant can submit this either from inside the nation or from outside it. The occupation of the candidate should occupy a valid space in the Skilled Occupation List (SOL). He should have his skills duly assessed by the concerned authorities. He should present an EoI. He should not be less than 18 years of age and not more than 50 years at the time of invitation. He should be able to meet the basic requirements, such as English language score along with health and character certificate. His score under the points system should not be less than 60. He can include his partner in his visa application. He and his partner’s dependent child can also be included in the application. He and his partner’s dependent relatives are also included therein. This visa allows his sponsored people and the holder to freely live and work in the Kangaroo Land. It also permits the holder and the sponsored people to study in any specific area of the country. They can travel in and out of the nation till the visa is legally valid. After meeting certain conditions they (the sponsored people) can apply for permanent residency also. Best of all is the power that a person holds is automatically enjoyed by his sponsored dependents. Hello Sir, I have applied for temporary visa 489 to live in SA in 19th September. My husband and son are the co-applicants. Just before that I applied for a PhD scholarship in an university in QLD. In the first week of December, I got the scholarship which provides full tuition fees and living cost. 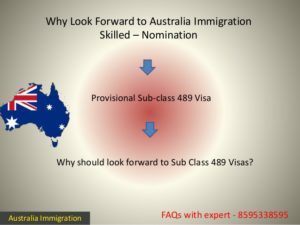 Can I move to Brisbane to study if I get the temporary visa 489 as granted? If yes, what would be the process? If no, can I decline TR visa 489? In this case, can I apply for immigration again at the completion of my study? Or, can I go back to SA after completion of the study? I am so confused and at a loss to take any decision. I really want to study and at the same time i don’t want to miss the opportunity of immigration. Please, guide me to take a decision for which I will not feel sorry in the future. Thanks for your comment. Sure we will guide you but for that I need few of your details. Kindly send me your updated resume of self and spouse at mustaqali@abhinav.com for valuation and assessment process and further guidance. How Do I Get Canada Permanent Resident Visa from India 2019?